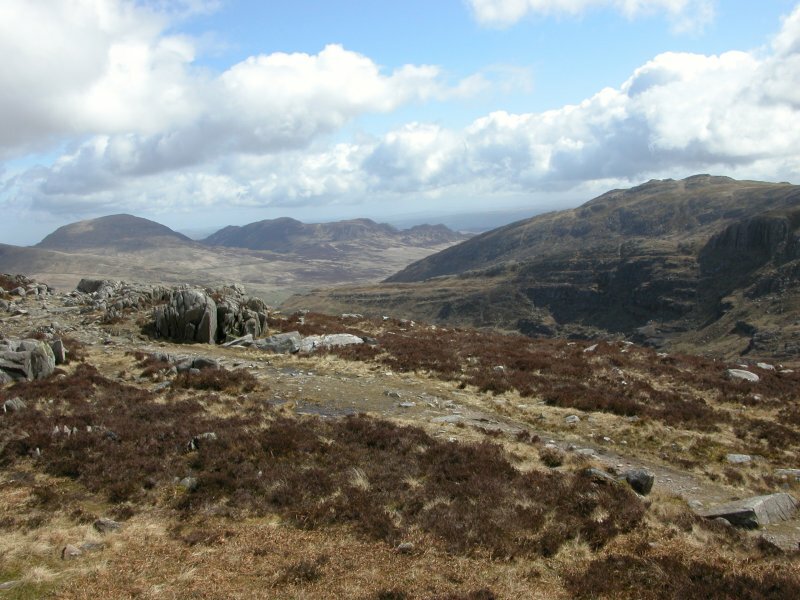 The Glyderau range contains the fifth and sixth tallest mountains in Wales, the shorter of which is only just short of a kilometre high, and the taller of which was only found to be over a kilometre high two years after this trip. It is supposed to have some of the best examples of glacial landscapes, and it's quite easy to see why. Depending on the weather, we had three plans (as well as fallbacks in other ranges). 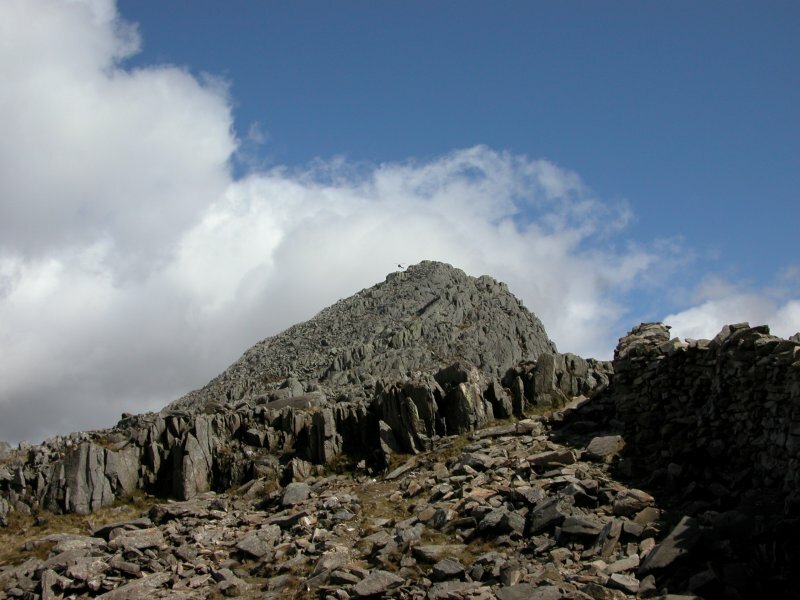 The first was simply to climb Tryfan. 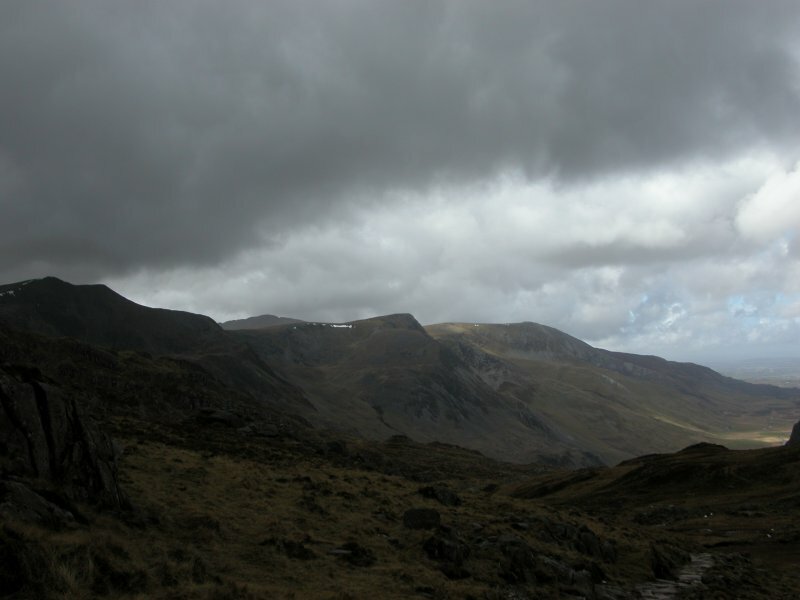 The second was to continue from Tryfan to Glyder Fach. 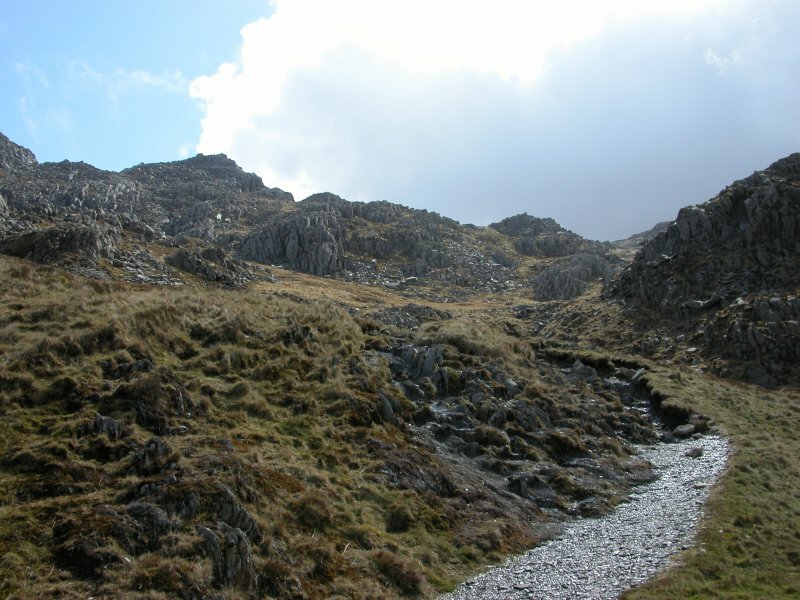 The third was to continue from Glyder Fach to Glyder Fawr, then down via a different route to complete a loop. 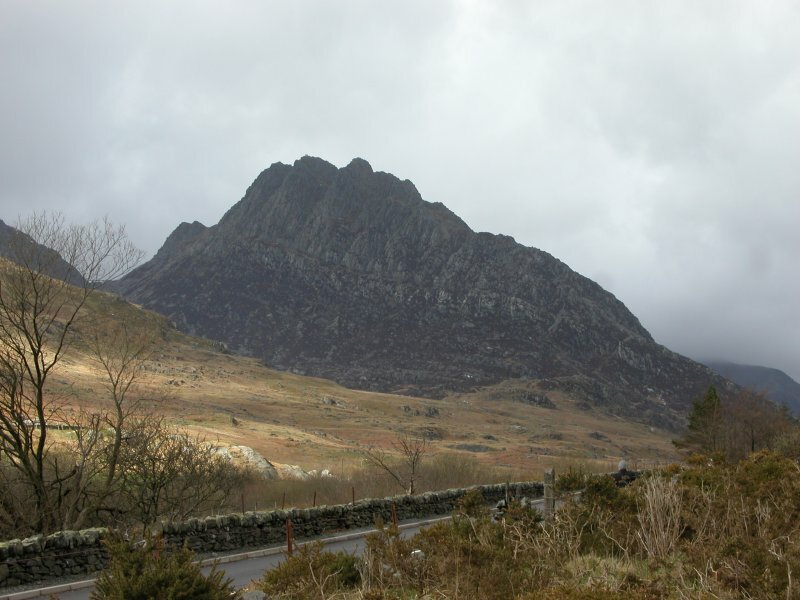 Tryfan (917 metres), the second most popular peak in the Snowdonia National Park, and a superb fluted mountain. When I walked the Carneddau back in December, my car was the only one out of about 200 that was being used for the Carneddau. All the rest were aiming for Tryfan. Crossing the outflow from Llyn Idwal, with Tryfan, Glyder Fach (994 metres) and Glyder Fawr (1001 metres) in the background, the sixth and fifth tallest mountans in Wales. The immense corrie amphetheatre around Llyn Idwal. 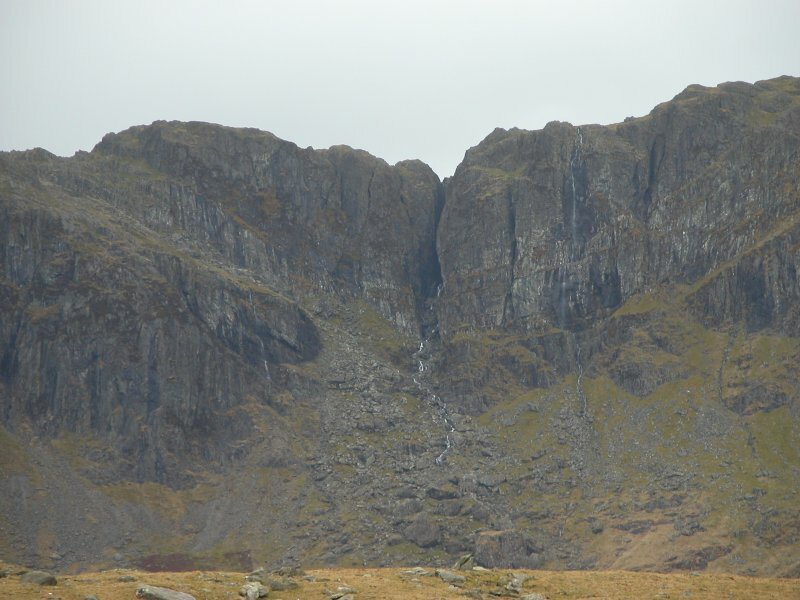 The cliffs, called Clogwyn y Geifr, are about 100 metres high, with a total dropoff of 500 metres to the floor of the corrie. 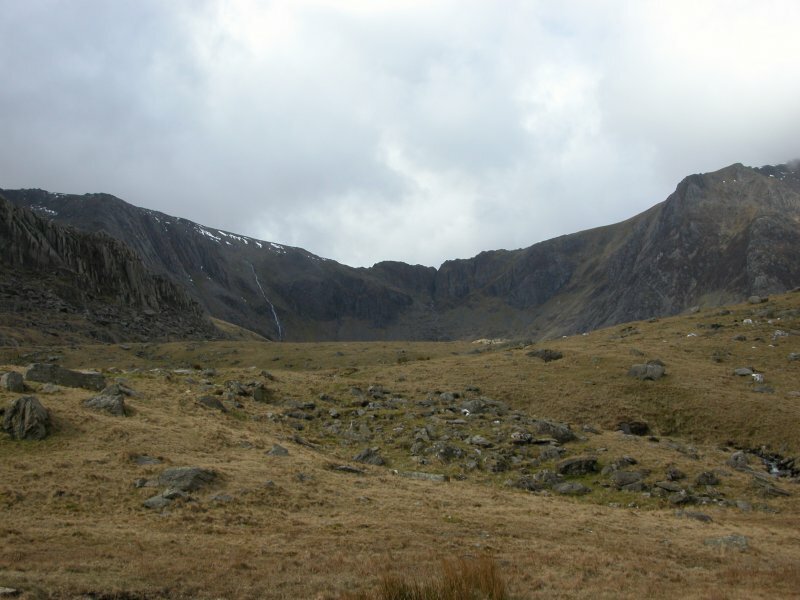 Twll Du/The Devil's Kitchen (the gap in the middle), and the cliff beside it, contain waterfalls. 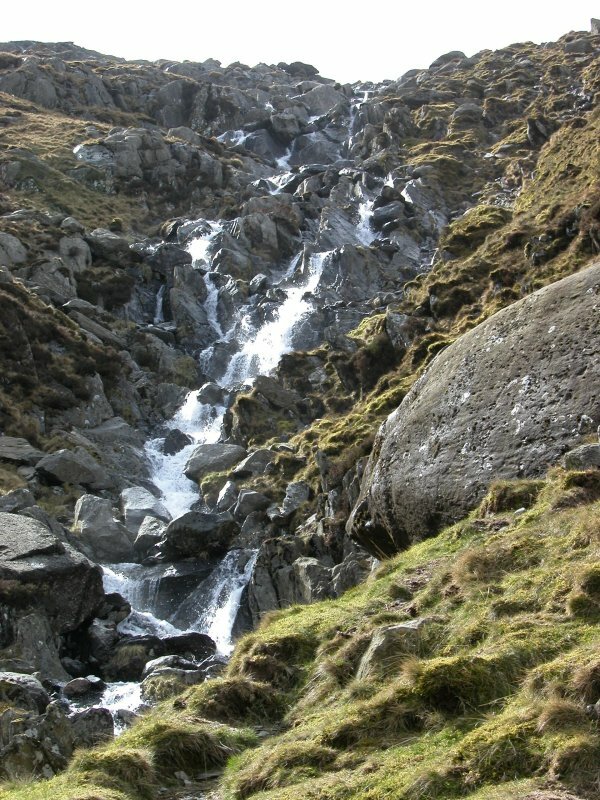 The one on the right is called the Devil's Appendix and is 93 metres high, making it the tallest waterfall in Wales. However, since it usually has only enough water to appear as a dribble, it is not normally noticed, and is not normally ranked as the highest. Depending on conditions, it can become a single leap, and in winter, it can freeze completely, becoming an ice climbing route. 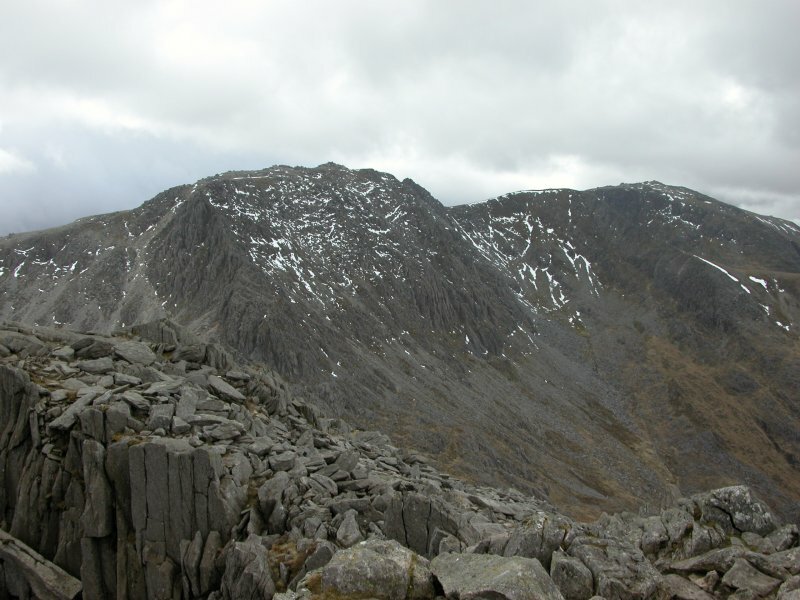 The continuing peaks of the Glyderau range; Y Garn (947 metres) and Foel-goch (831 metres), with Mynydd Perfedd (812 metres) in the background. 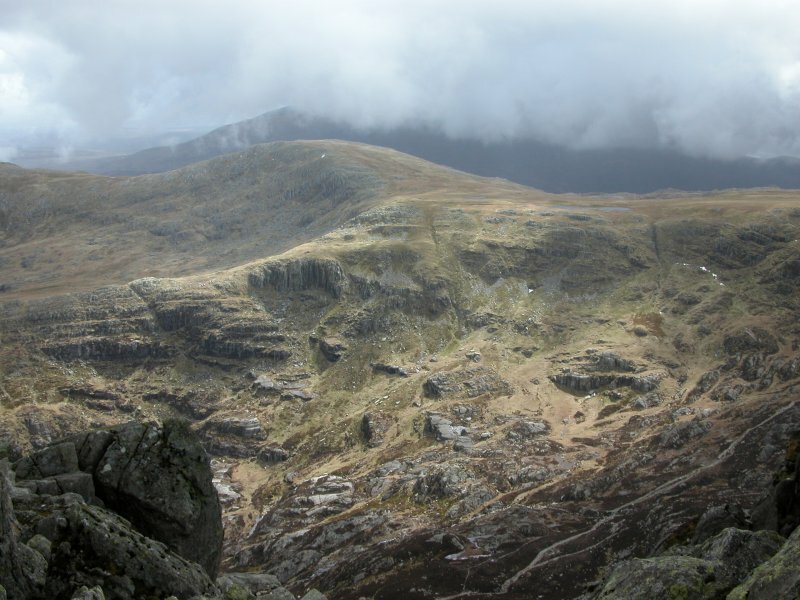 The beginnings of the Carneddau range, containing the third and fourth tallest peaks in Wales. The main peak seen here is the seventh tallest, Pen yr Ole Wen (978 metres). 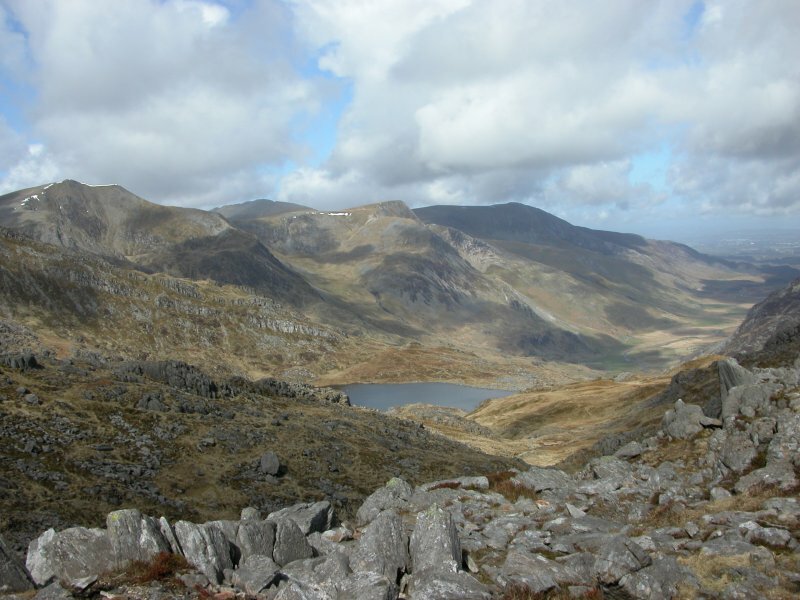 Tryfan, Glyder Fach, and Glyder Fawr over the corrie lake Llyn Bochlwyd. 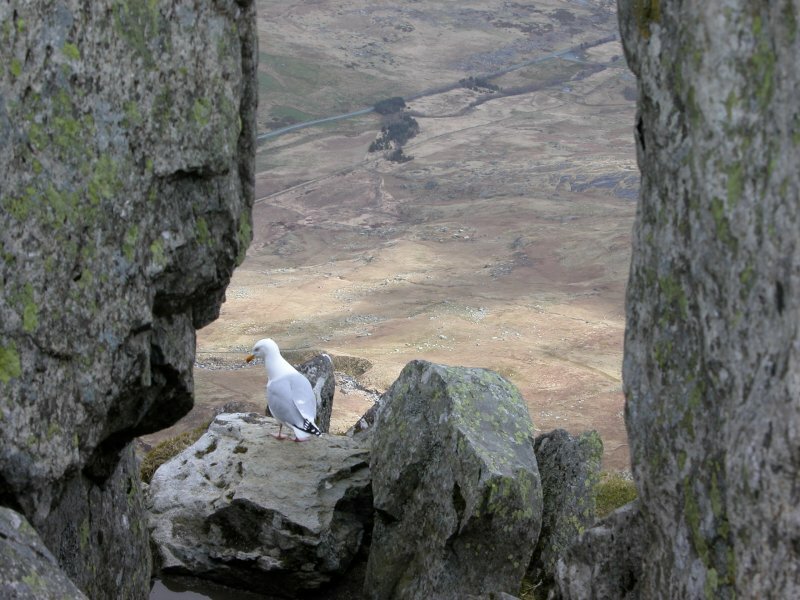 Snaking between the rock outcrops on Tryfan. 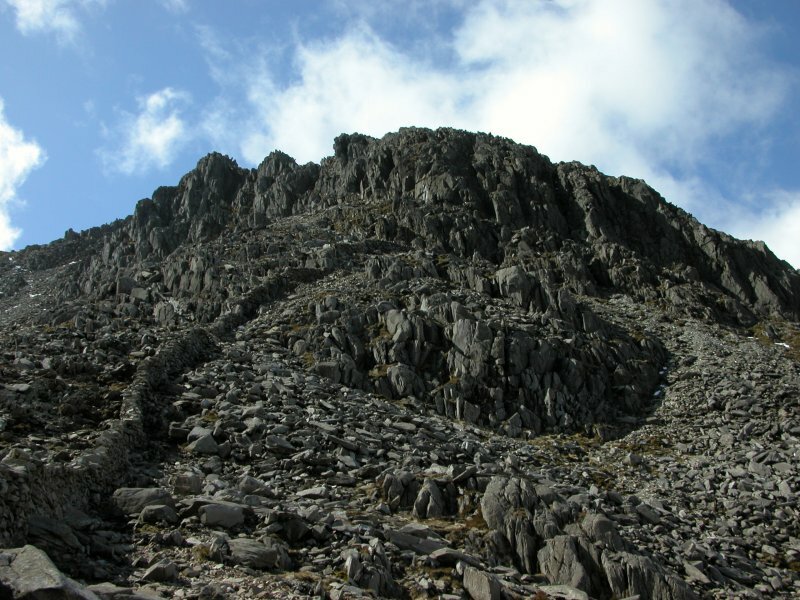 The steep slopes of glyder Fach. Apparently, the path up this leads up the scree slopes on the left. The side of Tryfan, where the path goes, without being well defined - whatever you can climb is a path. This also shows the helicopter that kept buzzing around making an annoying noise. Not entirely sure why they were being so annoying. Y Garn, Elidir Fawr (924 metres), Foel-goch, Mynydd Pervedd and Carnedd y Filiast (821 metres), seen over Llyn Bochlwyd. The view down the valley between the Carneddau and the Glyderau. 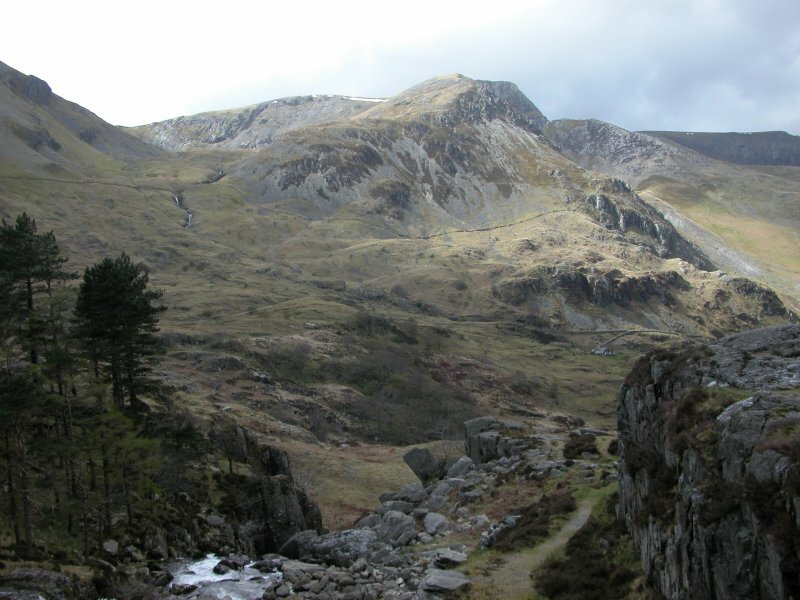 Pen Llithrig y Wrach (799 metres) and Llethr Gwyn (678 metres), with Gallt yr Ogof (763 metres). 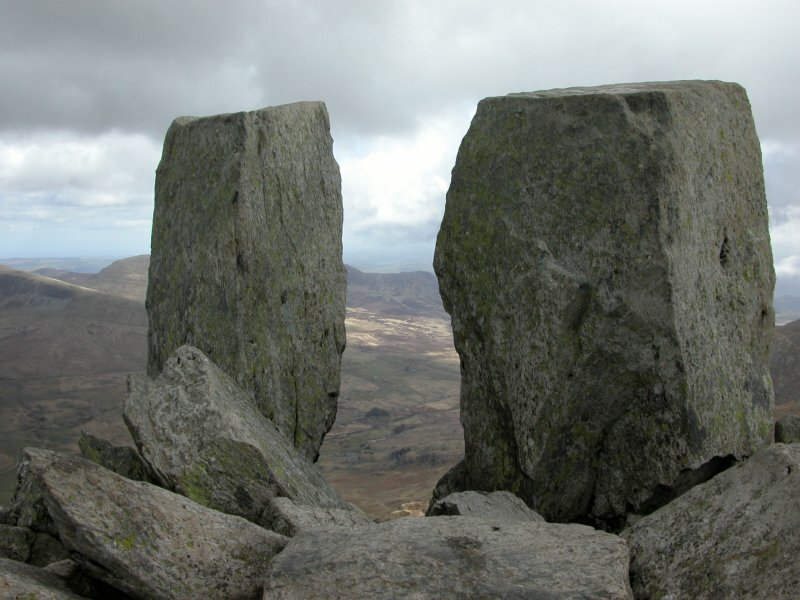 The view down the 450 metre face of Tryfan. 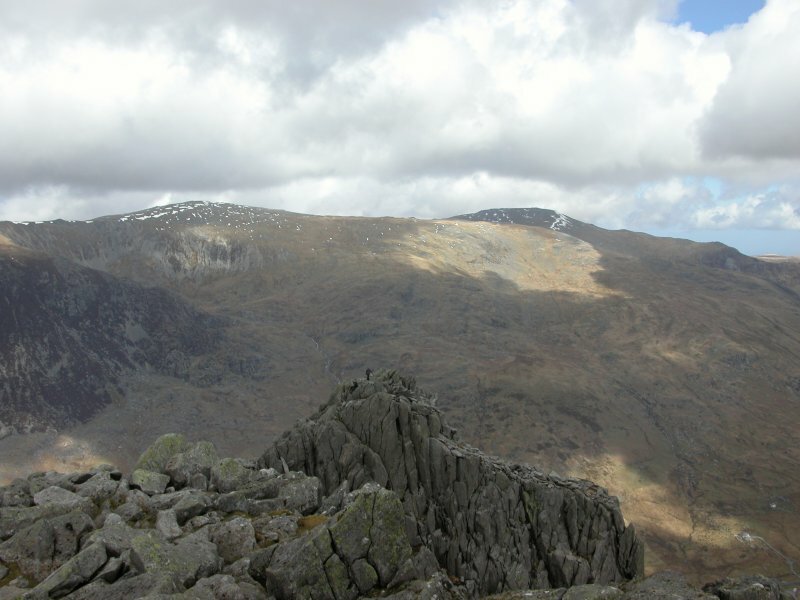 Glyder Fach and Glyder Fawr. 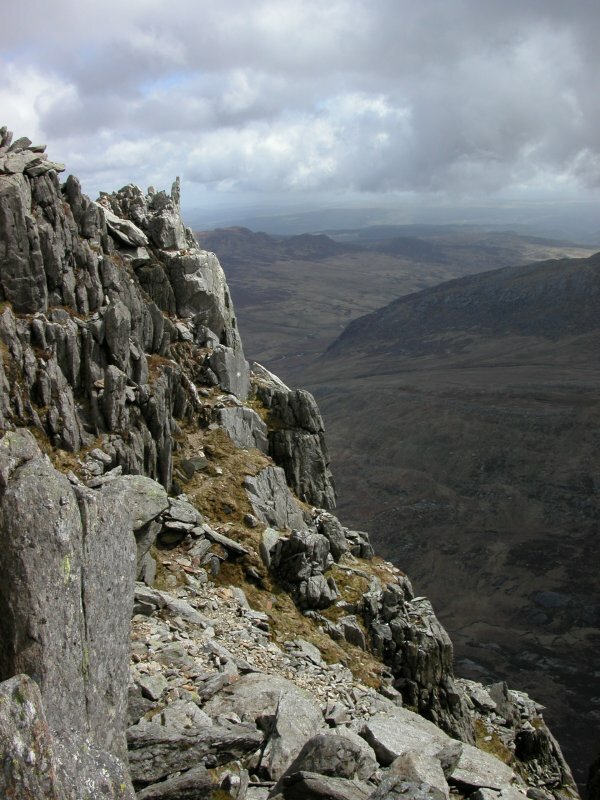 Tryfan's north peak, with Carnedd Dafydd (1044 metres) and Carnedd Llewelyn (1064 metres) in the background, the fourth and third tallest mountains in Wales, and the only 1000+ metre peaks not in the Snowdon massif. Eve and Adam. 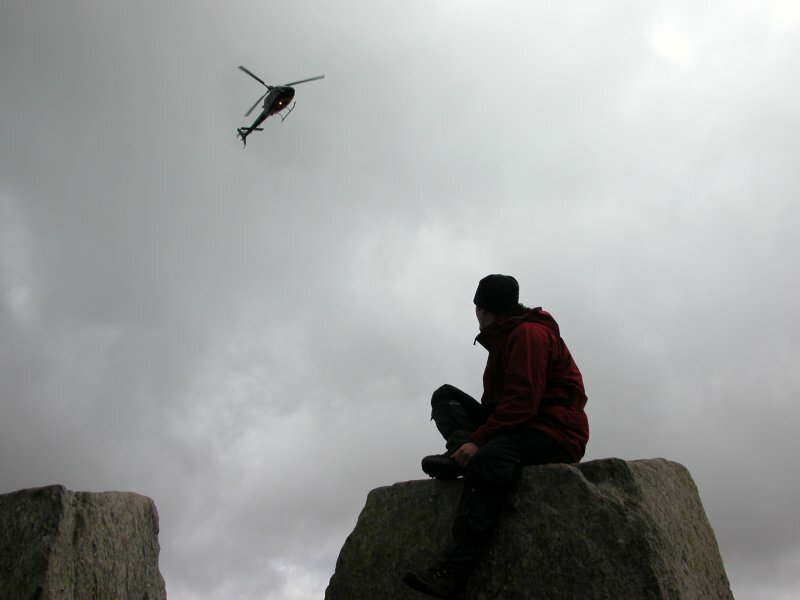 Jumping from one to the other is supposed to make you a Freeman of Tryfan, but given the winds up here today, and the 300 metres of cliff immediately behind Eve, that was not going to happen. Perched on the abyss. 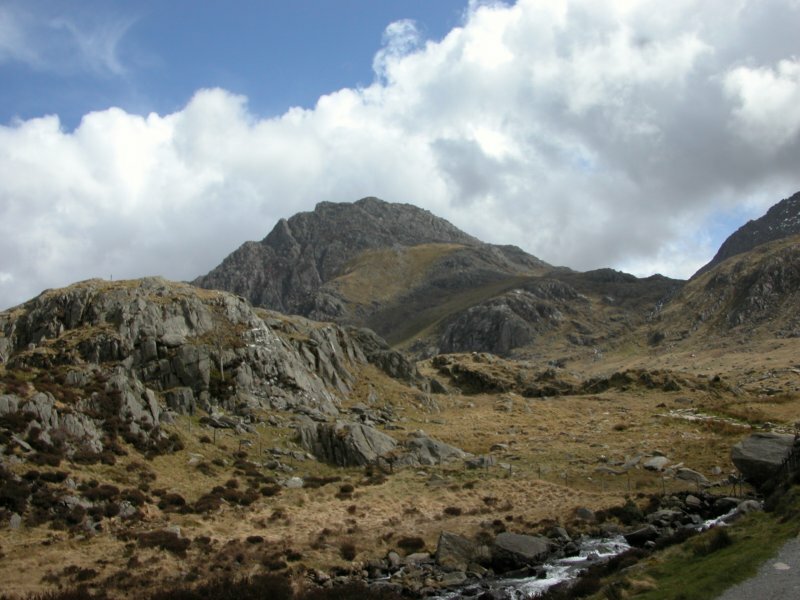 The name Tryfan is sometimes translated as Three Peaks (it actually has 4 peaks), but that would be Trifan not Tryfan. Tryfan means overturned peak. Sitting on Adam. Great shot by Claudio. Fractured rock over Cwm Tryfan. Corrie lakes of the Glyderau - Llyn Bochlwyd and Llyn Idwal. We descended Tryfan, aiming to continue the loop. 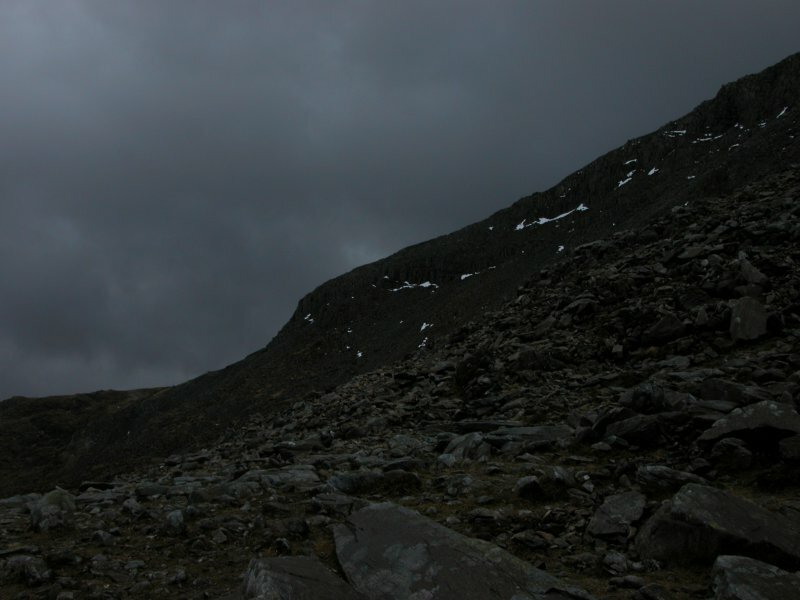 As we descended, the sky turned almost black, and a massive hailstorm started, with the wind pelting it into our faces. Having to cover our faces with our hands just to descend, did not give us confidence in being able to complete the route. A check on the updated weather forecast showed that it would continue with hailshowers for the rest of the day. Bands of hail continued to pelt us as we abandoned the walk, and descended back to the car. At least we had managed one proper mountain, and a very impressive one indeed. Temporarily clear skies over Tryfan. Foel-goch seen from the carpark back at Llyn Ogwen.